If you’re an athlete in training or a beast in the gym, you’re probably looking for a safe and healthy way to crank up your performance and push through to your fitness goals. We already know that focus, commitment, determination, and discipline, are the keys to a winning mindset, but did you know alkaline water may be that boost you’ve been looking for? Alkaline water is essentially water that has been infused with alkalizing compounds, including calcium, silica, potassium, magnesium, and bicarbonate. Western diets are filled with acidic foods and drinks, that can wear your bodies down over time. These alkalizing compounds can help buffer the acidity in your body, and provide you with a greater pH balance. Intense exercise produces acid in the body. When you’re pushing your body, your muscles produce more hydrogen ions than can the body can efficiently remove. The increase in acidity from the hydrogen ions is one of the reasons fatigue starts to set in. Drinking alkaline water during your workouts can enhance the body’s buffering capacity and balance the acidity, which can improve your performance during the workout. Another benefit of alkaline water is the minerals such as sodium, magnesium and potassium decrease cardio-respiratory stress and blood lactate responses. Long-distance runners will sometime supplement with sodium bicarbonate to get the better results. Drinking alkaline water gives you many of the same benefits. Over time the mineral content of alkalized water can help active people increase their body’s ability to retain more fluid in their cardiovascular system. Your kidneys and lungs are constantly trying to improve the acidic environment in our bodies, but there are ways you can make your body work more efficiently, with less stress on your organs. First, drinking water helps the kidneys by constantly flushing them out. One of the best ways to tell if you’re hydrated is looking at the color of your urine. When your kidneys can flush out toxins efficiently, your urine is very light in color. So, keep drinking to flush. But there are additional benefits for your kidneys when you drink alkaline water. By supplementing with the alkalizing compounds in alkaline water, the kidney has less work to do to balance the pH in your body. It’s a win-win situation! Your brain is composed of 75% water. Hydration is a big part of proper brain function that many people don’t think about. Research shows that even as little as your body experiencing 2% dehydration can negatively affect fatigue, mood, choice reaction time, short- and long-term memory, attention and even math. Your cognition and mood can be impacted by making sure you’re drinking plenty of water. As you may recall, earlier in this article I mentioned that some of the alkalizing compounds that are used in alkaline water include calcium, potassium and magnesium. The additional benefit of alkaline water, is the trace minerals that are in the water. Research shows that both magnesium and calcium help reduce fatigue and depression, while potassium can help with anxiety. Bar Up Fitness is committed to health and fitness, that’s why we try to always stay on top of the latest information in the health industry. In 2016, we launched Bars Up Fitness water, which is alkaline water for those of us that want the best for our bodies. Our water has a pH 9 and is infused with minerals and electrolytes to replenish your body. 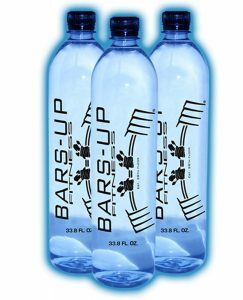 For more information on Bars Up Fitness water, click here or email barsupfitness@yahoo.com for more information on purchases and deliveries.